Starwood Preferred Guest has released the details of their next systemwide promotion that will launch on April 16th. This is the day after the end of the current promotion so there is no downtime in their global promotions. This promotion is relatively weak compared to many they have run and is really targeting those who do complete frequent stays or have a long stay coming up with Starwood. How so? The bonus does not kick in until the third night. For some that will be on their third stay or for others it will be on longer stays of three or more nights. That being said, once it does kick in and you have lots of stays earning that 250 extra points per night can provide a huge bonus (or return) especially if you are staying at the lower priced hotel brands of Starwood. The offer is open for registration and booking but stays only start counting as of April 16th. Keep this date in mind as it is very significant. 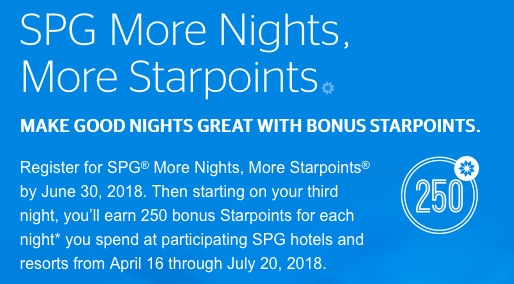 Find many more SPG bonus Starpoints offers here.